Cheesey Crutons (?) – Create, Make & Bake! 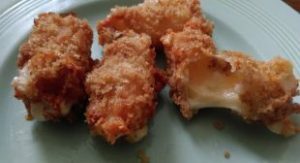 Okay so this abomination of my mind bares some resemblance to Mozzarella sticks, but are nothing like em. Lets try it, I thought, it cant be that bad, I thought. I spent too much time thinking ‘could I?’, rather than ‘should I?’. But now everyone likes them, and so I have to do em again. Easy enough I spose. But this is what happens when I’m bored, I shouldn’t be allowed to be bored. 1. Dip the cheese into the egg so that its thoroughly coated in egg, then roll it in the grated bread, pushing the bread firmly too the cheese thing. 2. 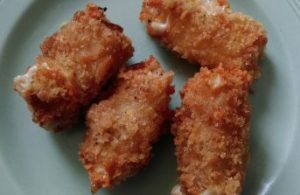 It has come to my attention that not overly many people have a deep fat fryer, you could use a frying pan but I don’t know cuz I havn’t tried it. Anyway, fry it until golden brown. Done.